In partnership with Rogue River-Siskiyou National Forest, the Applegate Stewards is a three year project in place-based learning, designed to explore the Applegate River watershed using the local landscape as a focal point. Students examine the physical and biological processes of the area and the effects of human activities on the natural resources. Ruch Outdoor Community School collaborates with the Applegate Partnership & Watershed Council to conduct riparian restoration and land monitoring for landowners and other agencies concerned with ecosystem health. A school tree nursery is in the planning stages for students to propagate seeds and grow native riparian tree species for planting. 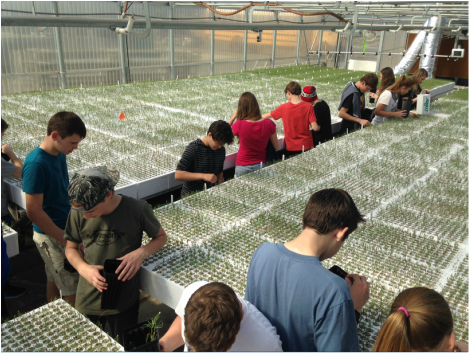 This project provides hands-on educational opportunities that promote an understanding of ecological systems and functions that impact the sustainability of the local watershed. Applegate Stewards acts as a feeder program for entry into South Medford High School''s Southern Oregon Discovery Adventure School or other career opportunities in natural resource management.